Pistol Shooting: Tues Nights @5 PM - You must have a pistol permit to shoot! Critter Dinner Feb 20th, 6 PM at the club. CAMPERSHIP: Anyone wanting to send a child to Camp Colby for Youth camp 11- 13 years old and Teen Ecology Camp for 14-17 years old please contact the club president at 518-201-4009 for more information. PRESIDENTS CORNER: So as many of you know we have a woman as the Club President. I thank you for your vote of confidence and ask for your support in the coming year. As I look at the New Year in front of us I see the vast potential of members that can help us move forward. We need members to help with our various fund raisers, working days, and other events the club needs help with. Many of the people that have helped over the years are looking to hand their knowledge to a new group of volunteers. They are advancing in years and with the accompanying pains that brings they would like to sit by the fires on cold nights and know that the time they have put into the club to work out the kinks have been passed on to new people that want to carry on the traditions the club has upheld for many years. Please don't be afraid to volunteer. There are events that raise funds for your club, this is your club, get involved. We are one of the largest clubs in this area, so let's keep growing and move forward. 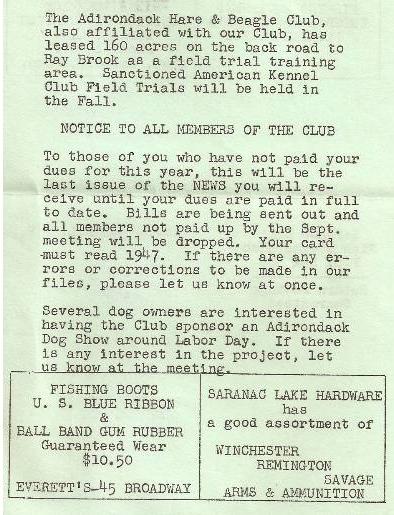 Do you know when and where the club was started and what the town officials said about it?